Students learn that materials can be identified using specific heat as a measurable characteristic. A known mass of water is used and the unknown material is placed in the water. 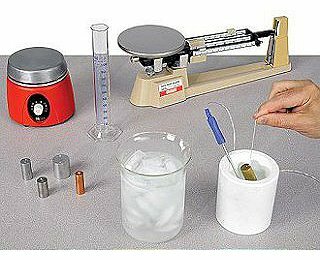 The initial temperature of the water and the unknown material are measured. The equilibrium temperature is found and from this the specific heat of the unknown material is derived. By performing this experiment in two ways (water warming, water cooling) students explore how experiment design may alter results. Finally students explore sources of error and magnitude of error. Room temperature A1 is added to hot water. After 210 s, the system has come to equilibrium and is slowly cooling. A linear fit to the cooling curve allows extrapolation back to find the equilibrium temperature that would have occurred at 131 s when the A1 was added if the system has come to equilibrium instantaneously. This allows measurement of the specific heat within approximately 10%.